Cameron Robbins, Anemograph Scorpius (Hepburn Wind Farm), 2018. 100 x 160cm. Courtesy: the artist and MARS Gallery, Windsor. Cameron Robbins works to make tangible the underlying structures and rhythms of natural forces. Using his wind powered drawing instruments; Robbins’ installations transcribe the invisible energies of nature, the wind, the tides and light to create drawings, photographs, and moving image works. These inquiries employ structural devices including kinetic wind or water powered mechanical systems. Their aesthetic is the result of careful engineering and resourcefulness. The outputs of these site-specific installations include wind drawings and sound compositions. 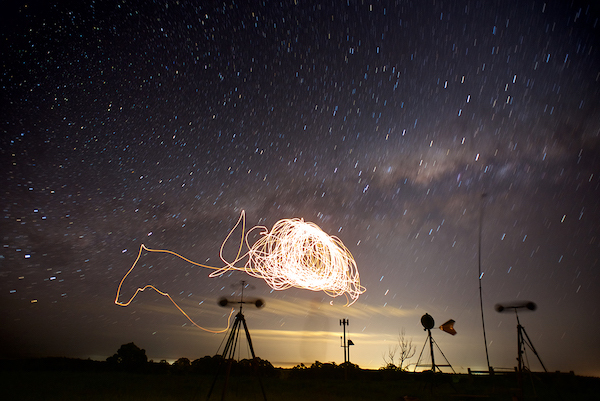 Sun, Stars and Wind presents new photography works from Robbin’s recent residency at Hepburn Wind Farm, created using his Anemograph machine, his Leanganook photography series taken in Portsea, 2018, and a selection of recent wind drawings.